Suggested Use: 1-2 capsules daily or as directed by a health care professional. Benfotiamine is a substance that, when taken orally, is converted into thiamine (Vitamin B1). It is found in food in only small amounts. Thiamine itself has been used for many years to treat neurological disorders but its poor absorption and rapid metabolic conversion makes it difficult to achieve therapeutic levels in the body. Benfotiamine solves this bioavailability problem. Taken orally, it is well absorbed and remains in the body for days. nerve damage due to vitamin B-1 deficiency after gastric bypass surgery. It is also used by bodybuilders to improve muscle flexibility and performance. 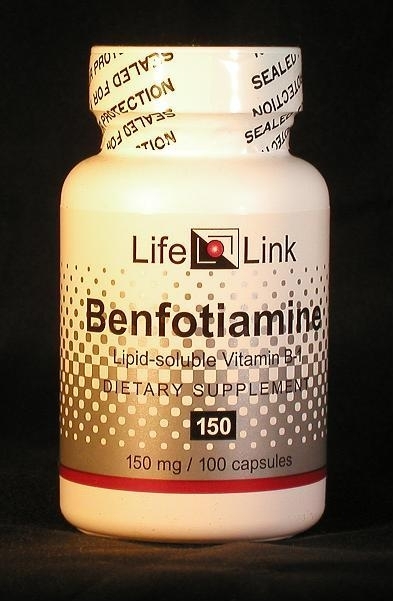 Benfotiamine is a substance that, when taken orally, is converted into thiamine (Vitamin B1). It is found naturally in plants of the onion family, but the amounts present are miniscule. Thiamine has been used for many years to treat neurological disorders. But this form of the vitamin is poorly absorbed and rapidly metabolized, making it difficult to achieve therapeutic levels in the body. Accordingly, we will limit our discussion of benfotiamine to a brief summary of relevant research, and let you draw your own conclusions about what medical conditions it may be effective in treating. Thus, thiamine works to prevent high concentrations of glucose from developing in cells and thereby decreases the damaging effects which glucose has on the body’s tissues. And thiamine also helps to maintain nerve function. a small portion of the glucose molecules, instead of being metabolized, react chemically with proteins in the tissues, producing crosslinks (‘AGEs’) that impede or inactivate the proteins. The result is a loss of flexibility and function in skin, muscle, and all other living tissues. Indirect evidence suggests that thiamine plays a fundamental, but still-obscure, role in cell signalling — not only in mammals, but throughout the biological world. During the evolution of nerves as specialized communication cells, this role of thiamine evolved, too. For example, thiamine came to be involved in controlling the pores in nerve cell membranes through which ions pass during neural activity.12 Thus, thiamine levels seem to be correlated with the efficiency with which nerves conduct information. Injections of vitamin B-1 are sometimes used to correct such B-1 shortages, but benfotiamine offers a more convenient approach that can — and should — be followed soon after surgery rather than waiting for symptoms of nerve damage to appear. Is benfotiamine useful for the conditions and purposes mentioned above? We aren’t allowed to tell you, so you should take a look at some of the references cited here, and then decide for yourself.